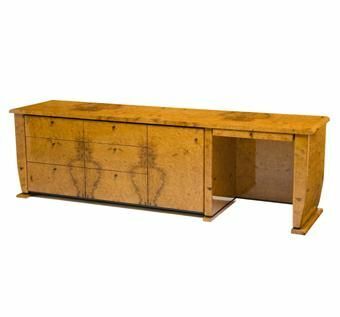 A large Art Deco style desk/dresser veneered in Myrtle Burl with Maple drawers and interior. This piece serves several functions in a single well organized whole. It has four dresser drawers on the lower left side and two jewelry drawers on the upper left side. 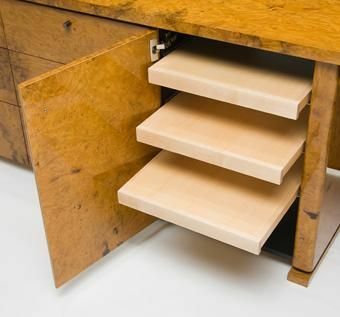 There are also two additional hidden drawers behind the upper two drawers. There are three slide out trays for electronic equipment behind the center door and a small writing desk with a single pencil drawer on the far right. The finish is Conversion Varnish over Polyester fill and has been polished to a high gloss. The black detailing and interior are Pigmented Lacquer. 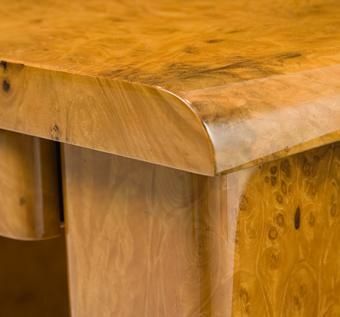 The Myrtle veneer was dyed lightly to a golden brown color.